There are many similarities between yoga and pilates. While yoga is an ancient system made up of what is known as the 8 limbs, the most common area of practice in western society is asana or the postures followed by pranayama or breathing. Practicing yoga helps the participant receive physical benefits such as increased flexibility, improved respiration, a balanced metabolism, cardio health, and decrease in injuries if practiced correctly. It also incorporates mental benefits such as stress reduction and mental clarity. By combining the two practices, participants can increase their general health and wellbeing. For each of the postures listed, focus on quality versus quality. By focusing on proper alignment and activating the appropriate body part, practitioners will receive the actual benefit of the pose. If not, much of the benefit is lost while students develop bad habits and possibly injure themselves. For yoga and pilates, the breath is crucial. During the practice, take non-exaggerated gentle breaths. When inhaling the ribs should lift up and expand and when exhaling the ribs will come back to center with a gentle downward motion. To practice, start seated with one hand on the heart and the other on the belly. Sit up tall and on the inhales try to get the breath down towards the belly while the rib cage expands and on the exhale let the belly, then the rib cage and the chest gently release. Some of the postures listed below have both a yoga and Pilates name. The yoga name is listed first and the Pilates second if it is a dual posture. After getting into a rhythm with the breath come into child’s pose /shell stretch. This posture will help stretch the spine, shoulders, neck, and abdomen. Start on all fours on a yoga mat and release the buttocks down towards the heels while extending the arms forward. Keep the hands in front of the shoulders while lengthening the arms. Take in several deep breaths trying to release the hips farther down on the exhales, practicing the posture for ten to twenty breaths. Mountain pose is the foundational posture for many postures in both yoga and Pilates because it helps establish a base. Mountain pose helps improves posture and while it may look like people are simply standing there, this is an active posture when practiced properly. From child’s pose, come into a standing position. Let the feet come to about hip distance apart and anchor the feet deeply into the ground. While the feet root, let the crown of the head lift towards the sky while the chin stays parallel to the floor. The hips are neutral, meaning the lower back is not overly arching or the hips pressing too far forward. Let the belly come in towards the spine while the shoulders relax. Engage the legs so all of the muscles are activated. The posture should feel strong while the breath flows consciously in and out of the body. Spend between ten to twenty breaths here, feeling the posture and its strength in the body. 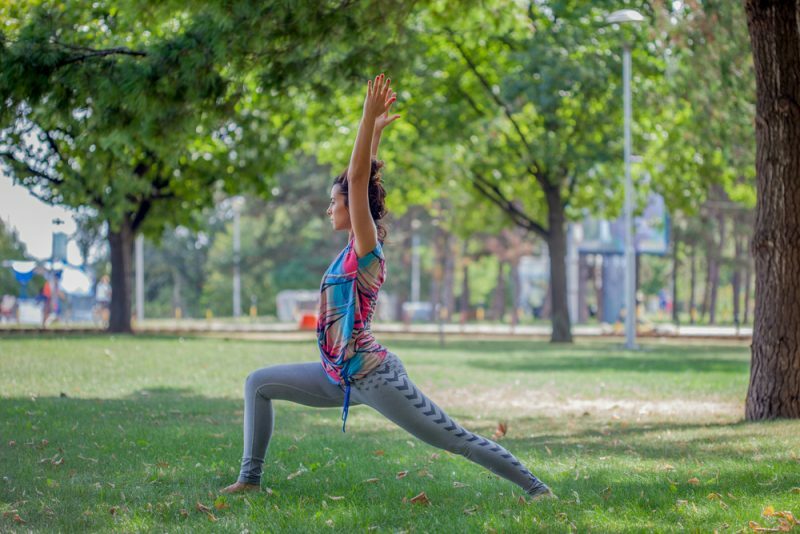 Warrior I is a yoga posture that incorporates the hips, legs, quads, and shoulders. From mountain pose step start with the feet parallel between four to 6 inches apart, potentially even wider if the body needs more stability. Step the left foot back between three to four feet and bend the right knee. The hips should be facing forward. Like mountain pose, the feet should be anchored into the mat, particularly the back foot which may have a tendency to roll forward. Reach the arms up overhead while palms face each other approximately shoulder distance apart while the shoulder blades release down the body. Breathing deeply, hold here for five to ten breaths. Come back to mountain pose when complete and repeat on the opposite side. Present in both practices, downward dog helps build bone density, awakes the body, strengthens the back, increases circulation, and strengthens the whole body. From mountain pose, come into a forward fold and place the hands on the floor. Step both feet back between three to four and a half feet with the feet hip distance apart. The hands are shoulder distance apart. Let the fingertips face the front of the mat, firmly pressing the entire part of the hands downward. Lift the hips up towards the sky and then release the hamstrings towards the back of the mat. By pressing the hands into the mat, let the belly get closer towards the things without moving the hands or the feet. Try to keep the shoulders away from the ears. Keep the belly towards the spine while trying to find length in the back. Hold here for five to ten breaths. Cobra, also known as Swan in Pilates, is an excellent back posture. In addition to strengthening and stretching the back, it also helps open the chest, abdomen, and the hips. In a modern society where people are constantly hunched over either due to being behind a desk, automobile, or simply stressed, this posture can help improve the overall health of a person when practiced frequently. From downward dog, lower the body all the way down to the mat on the belly. Spead the feet approximately hip distance apart and rest the tops of the feet on the mat. Let the hands press into the mat underneath the shoulders while the pelvis presses into the mat. On the inhalation, let the forehead, then the chin, shoulders, chest, and ribcage gently lift off of the mat. The lower body should continue to lengthen while the shoulders relax. On the exhalation, slowly lower the body down in reverse order. Complete for ten repetitions. Piegon is present in both yoga and pilates. It is an intense hip opener that can help combat common health issues such as sciatica and lower back pain. From cobra/sleeping swan rise into a downward facing dog and bring the right knee down toward the mat next to the right wrist as the left leg extends back with the knee and top of the foot resting on the mat. A blanket or block may be needed to place under the right glute to keep the hips even. Once stability and balance are brought to the hips, let the right shin come as far forward as it can without rolling to the right side. Lower the torso down towards the floor and extend the arms forward with palms facing down. Hold this posture for fifteen to twenty breaths making modifications as needed before repeating on the opposite side. 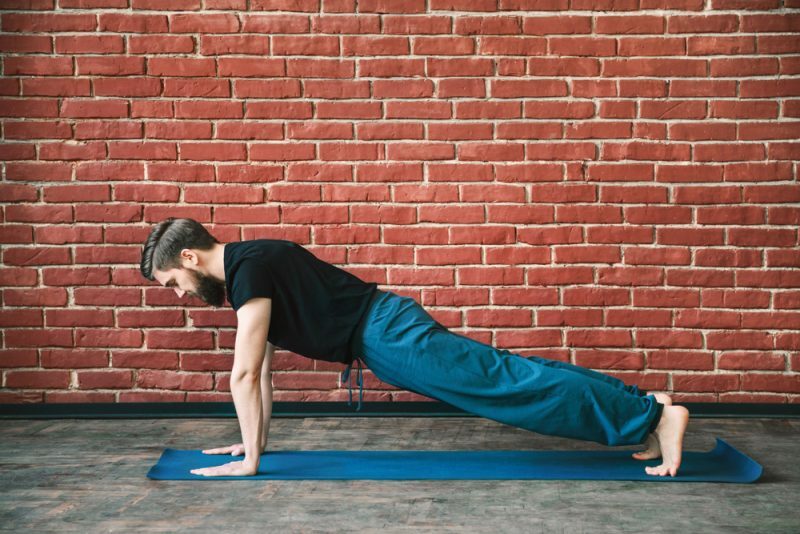 Plank pose helps tone the whole body while targeting the abdominals, assisting with shoulder stability and strengthening the arms, glutes, and legs. From pigeon, after doing a few circles with the hips in three-legged dog lower both knees down towards the mat and let the hands press into the mat underneath the shoulders. Walk the feet back and press the toes into the mat. The abdominals will engage and the back should be relatively flat with neither the glutes lifted higher than the lower back or the hips sagging towards the mat. In general, the body is straight. Hold this posture as long as possible without shaking or holding the breath. If the breath or body becomes uncontrollable lower the knees down and rest until the breath has stabilized. Complete two more repetitions. Both yoga and Pilates have a version of boat pose. In the yoga version, the legs are together whereas, in Pilates, the legs are in a V shape. In both versions, the abdominals, spine, and hip flexors are strengthened and can improve digestion. From plank pose, lower the knees down, roll the spine up, and then transition to a seated posture with the legs in front of the body. Bring the hands to the mat, next to the hips. Bend the knees to about 45 degrees and start with the feet on the mat. Lengthen the spine while keeping the chest lifted. While keeping the chest open and lifted, extend the arms forward. If possible try to straighten the legs. In both practices, it is crucial to maintain a natural breathing pattern. Hold the posture as long as possible until it no longer seems possible to maintain the breath. Rest and then practice 2 more repetitions. Both yoga and Pilates incorporate bridge pose. The aim of this posture is to lengthen the body through the spine. Bridge helps strengthen the glutes, the hamstring, and the abdominals. From boat pose, gently lie on the back by placing the feet on the floor and slowly rolling the spine down. Let the gaze stay towards the ceiling and let the knees bend to 45 degrees with the feet hip distance apart. Gently initiate a pelvic tilt towards the rib cage while lifting the tailbone. One vertebra at a time, slowly lift the rest of the spine as far as the base of the shoulder blades. For the breath, inhale during the lift and exhale as she body lowers back down towards the floor. Repeat this movement five times while working towards 10 repetitions. From half bridge, let the legs extend down towards the mat. At this point, there is no need to either control the breath or the body. Instead, this posture will let the mind and body relax. As the entire body comes to the floor, let the arms come along the side of the body, palms facing upward. The body can be supported by bolsters, blocks, or covered with a blanket. Sandbags and eye pillows can also help get the most out of the posture. After finding a comfortable position, lie silently on the floor trying to stay present in the moment. If the mind starts to wander, begin to observe the breath. Noticing the natural breath can help keep the mind from spiraling out of control into the past or the future. Let the body rest in this stage of active relaxation for five to ten minutes. Pilates has multiple postures derived from yoga. Both practices help strengthen and stretch the body while incorporating the breath for relaxation. By practicing postures together, there can be a positive impact on overall health and wellness.